On my first glance back on this week, it seemed like nothing remarkable occurred. Just another ordinary week. Upon closer reflection, several building blocks were put into place. These things should be probably have been addressed much sooner but it is “better late than never”. I have had several conversations this week with other parents about consistency in parenting. It has really made me assess how consistent I am in my parenting. When issues crop up, do I react the same way each time, giving the same appropriate and effective discipline? One of my kid’s friends wasn’t allowed to go to her sporting activity where my child would be several weeks ago because she was rude to her parent just before they left home. This child had been eager to see my child as they had been separated by a holiday for several weeks. This consequence was deemed appropriate in this situation and since then, the child has learnt her lesson. This child was warned of the consequence but still acted inappropriately at the time. I encouraged the parent in following through on her word. It caused me to reflect on “Do I always follow through on the consequence, no matter where we are?” “Can my kids rely on what I say and the consistency of what to expect?” I must confess that this has not always been my strong point. I have tended in the past to give them a second or third chance. Thus, the consequence of my behaviour is that they have realised they could get away with some inappropriate behaviour. The outcome has been that I have realised my fault and am tightening up. This means that there are a few adjustments all around in the family. It would be easier to not deal appropriately with it, but that isn’t fair to the kids either. Better sooner than later. Night time fear: Another issue needing dealing with these past couple of weeks was Matey having “bad thoughts” of a night just before going to sleep, resulting in him becoming scared. Up to this point in time, we have never had to deal with this with either of our kids. Interestingly it has corresponded with the beginning of daylight savings (thus it being a lot lighter of an evening – although this shouldn’t be an issue as he used to go to bed ultra early anyway), a break-in in our neighbours home, plus a massive dejunk of his bedroom resulting in a room that is now very tidy and with minimal toys and junk. Also, the first night that this happened, he was allowed for the first time to sleep in our bed. A combination of all this has led this to be a reoccurring theme. I did not want to dismiss or deal with this lightly but I also didn’t want it to escalate out of control. A child’s fear needs to be validated. A child with a prophetic gifting (ie being able to sense, see, hear, feel stuff spiritually) is apparently heaps more prone to this. We chatted about his concern, validated it but didn’t want it to get out of control. We pray and ask God to send His angels to surround him every night as part of his bedtime ritual. Matey has a Bible Verse printed out & stuck above his bed from Isaiah 43:1 “Don’t be afraid. I have rescued you. I have called you by name. Now you belong to me.” Matey has memorised this verse & can say this when he is scared. Matey also knows how to use Jesus’ name to help him in this situation. We also got Matey to ask God to show Himself to Matey and give, show or tell him something. One of the nights, Matey expressed the desire to see God in his bedroom but didn’t think that was at all possible because God is in heaven. I asked Matey to ask God if He could come to Matey’s room. Within 5 minutes, Matey called out to me that God had visited him in his bedroom. He could tell me that God had very kind eyes and even the colour of His eyes, how many freckles God had, the colour of his hair and beard etc. This was so reassuring for Matey. Visual and auditory processing: Matey has been undergoing intensive visual and auditory processing therapy with a behavioural optometrist for the last few months. This really adds to both his and my workload with the required memory work every day. It has helped me realise that good old fashioned rote learning, with the aid of visual cues, is extremely helpful to him in his learning style. Keys to Revival: All our family had the privilege of hearing John and Carol Arnott from Toronto Church in Canada in Frankston this last week. Hubby went on the Monday night and loved how both John and Carol love people and express that love. Hubby commented that he had never seen anyone before ooze God’s love the way they do. The only other time I could get to hear them was to take the kids with me to the Pastors and Leaders session on the Tuesday afternoon. It was great to just hear John Arnott reflect back on his life and ministry where they had a continual revival at their church for approximately 20 years. He emphasised that really understanding the Father’s love is so important, as well as our prayer life as well as learning to deal with the issues in our life. He emphasised that their staff all have an inner healing session each year so that there is no ‘junk’ in their life that hasn’t been dealt with. They know how to forgive and keep short accounts!! Swimming and supporting family members: The end of the week was Matey’s first swimming race night. He has recently gone up a level in swimming, meaning that by this time next year, he will be in swimming squad. He is now allowed to go to race nights and enter four swimming races. Since it was a huge milestone for him, he wanted all the family to go along and support him. This was an important lesson for Princess as she was wanting to go to the beach with the neighbours. She came reluctantly to the swim night. This was an important event for Matey and she had to realise that in the past, Matey has supported her and gone along to all her events. She doesn’t need to come to every race night, but the first one was important. Princess’ own swimming squad race night is next week, so we are spending a lot of time at the pool at the moment with lessons, training, and race nights. Sometimes supporting another family member is more important than our own wants. 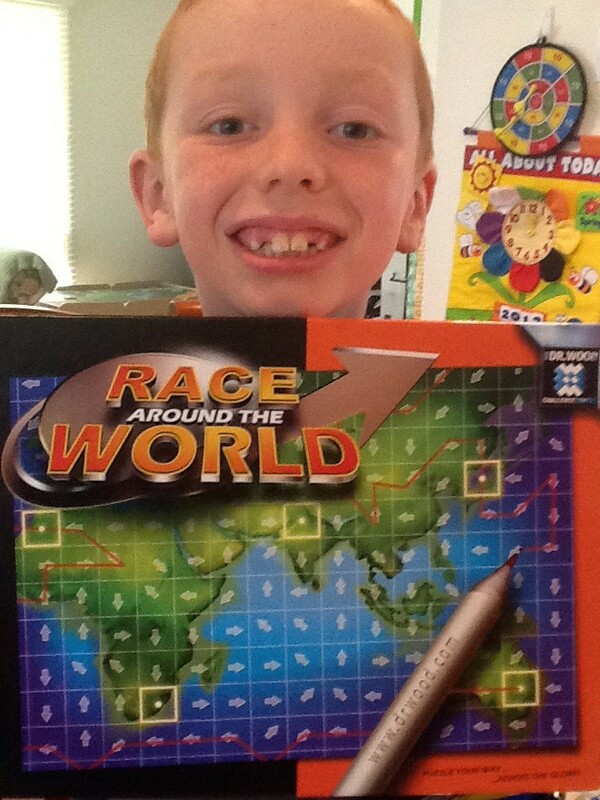 Race Around the World Game: The latest board game we have played is “Race around the World”. This is more of an individual board game or it could be used as a competition between several people to see who can do it the quickest. I bought it thinking that it would help the kids’ geography skills. It will help more with their lateral thinking and spacial perception. In just doing the first five maps, Matey learnt that New Zealand’s two Islands were called the North and the South Island and that the kiwi is an endangered and native bird to New Zealand. Princess learnt the names of six cities in Scandinavia and where they were on the world map. Map 3 was about Easter Island so we then brought out the globe and found where Easter Island was. We googled it on the internet and found out a bit of the history and the problems it faces today being considered one of the world’s remotest islands. Map 5 was about Alcatraz Island, so that was also worth googling and Matey loved finding out all the details of that island and fort/prison. 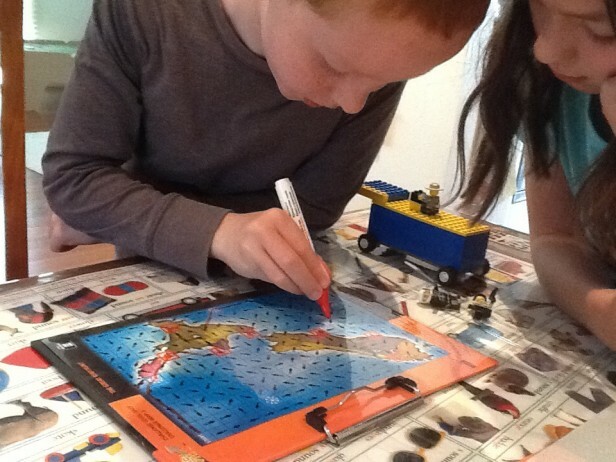 The game comes with a clipboard, 24 maps of parts of the world, a transparency sheet, a whiteboard marker and an eraser. You place the map on the clipboard with the transparency sheet over the top. This is what you draw on with the whiteboard marker so that the map can be reused. You follow the arrows and get to the treasure or cities. Your aim is to get to each city only once and get back to the original city in the quickest time. The catch is that you have a choice of which arrow to take once you get to a city. You need to follow the arrows. It takes skill to look ahead, follow the arrows with your eyes, and see if you can get to the next city, and then remember which route you took to draw it. I must confess that I probably wouldn’t buy this game unless you already have a lot of other board games. It is very individualistic but it does help you with some skills.